Three recent articles have got me thinking about the current state of the American church. Each article explores issues related to the mission and future of specific subgroups and movements within the church. The various groups, one racial and the others formed around doctrinal and ecclesiological emphases, seem to reflect where we are today as a body—desperately searching for an identity and purpose that aligns us with God’s call, but sadly fragmented and self-centered in our attempts to get there. The first article, “The Black Church Is Dead,” by Princeton professor Eddie Glaude, caused quite a stir when it was first published in The Huffington Post a couple months back. In fact, the article inspired the Religion Dispatches website to convene an entire forum around the subject. 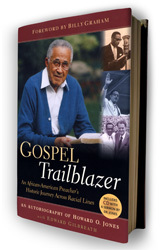 Glaude’s clearly provocative and attention-grabbing title overshadows an important point that he makes in the article: that many Christian leaders in African American congregations must move beyond the pomp and circumstance of the black church’s illustrious and prophetic past and concentrate on what it means to be faithful and relevant in this current era. I think this is a good message, not just for African American believers but for the American church as a whole. In truth, the term “emerging church” should encompass the broader movement and development of a new face of Christianity, one that is diverse and multi-ethnic in both its global and local expressions. It should not be presented as a movement or conversation that is keyed on white middle- to upper-class suburbanites. I couldn’t agree more. Yet, another part of me wonders if there’s a need for something like the “emerging church” in the first place. While I resonate with certain aspects of the movement (particulary its challenge to us to reexamine our traditions and cultural practices and ask whether they truly line up with what God’s calling us to be), I’m also put off by the whole branding and commercialization of the thing. The juxtaposition of these two sold-out conferences, which represent two of the most important strands of evangelical Christianity today (the neo-Reformed movement and the “N.T. Wright is the new C.S. Lewis” movement), made the question (problem?) of unity within the church impressively pronounced. For the T4G folks, protecting disputed doctrines against heresy is where good theology is born. Clear thinking comes from friction and protestation, from Hegelian dialectics (R.C. Sproul spoke on this), but not from compromise…. The exact opposite point was made at the Wheaton Conference by Kevin Vanhoozer, professor of systematic theology at Wheaton, who suggested that theologians like Wright (and, presumably Christians in general) are more often correct in matters they collectively affirm than in matters they dispute. This statement reflects the contrasting spirit of the Wheaton Conference as regards unity: It’s what we affirm that matters. He goes on to note that “the elephant in the room” at both events was an ongoing debate on the doctrine of justification between the Anglican bishop N.T. Wright and the Reformed preacher John Piper. Reportedly, both men took rhetorical swipes at the other during their talks, and drew cheers from their respective audiences. I’ve been privileged to attend past theology conferences at Wheaton College, as well as events sponsored by those who would fall under that “neo-Reformed” heading. My sense is that God is doing good things in both camps. Conferences inherently are designed to bring together groups of people who share some likeminded affinity. Unfortunately, in the church those affinities are often framed in contrast to what some other group that we disagree with is or isn’t doing. It occurred to me while reading those three articles that we spend a lot of time reflecting on who we think we ought to be as the church. Then, once we’ve gotten a critical mass, we brand it and stake out our special turf. Before long, we’ve got our own special line from Zondervan, IVP, or some university press and we’re packing them in at our annual conference. Unfortunately, over time, we wind up sounding like our way is the most effective way, if not the only way. Emerging, missional, seeker-sensitive, Black, Calvinist, multicultural, Dispensational. And the list goes on. It’s important to know who we are and what we believe in, but perhaps we waste too much time attempting to respond to or live up to historic monuments and cultural trends that we’ve proudly embraced as a way of defining ourselves or distinguishing our group from others. Usually what we’re saying when we do this is that the other parts of the church have gotten something wrong and we are preserving or reasserting what’s most important. That’s not always the case, and we may not always be that self-aware about it, but think about it a minute. Think about the labels you wear as a Christian—as a church. Then ask yourself why. Would you feel comfortable or secure giving up those particular labels and simply going about your business as a generic follower of Christ? What if both conferences had merged and two seemingly antagonistic groups of Christians put aside their differences for a few minutes to just sing (in both conferences the hymn “Praise to the Lord, the Almighty” was sung), side-by-side, in worship of the triune God who gives the same grace through which all who follow Christ have been saved? Time magazine’s January 11 issue hit newsstands last week with a compelling teaser on its cover: “How Megachurches Are Helping Bridge America’s Racial Divide.” Soon, emails and Facebook updates from friends alerted me to the article and urged me to check it out. A Time report on Christians and the racial divide? This was a big deal. Racial reconciliation among evangelicals is one of those topics that come and go based on who’s currently talking it up. Back in the mid-1990s, when groups like the Southern Baptists, Pentecostals, and the Promise Keepers men’s ministry were on the reconciliation bandwagon, it was all the rage. But Christians who are engaged in race and justice issues on a daily basis know that these periods of heightened interest typically fade after people lose that initial “we are one” buzz. 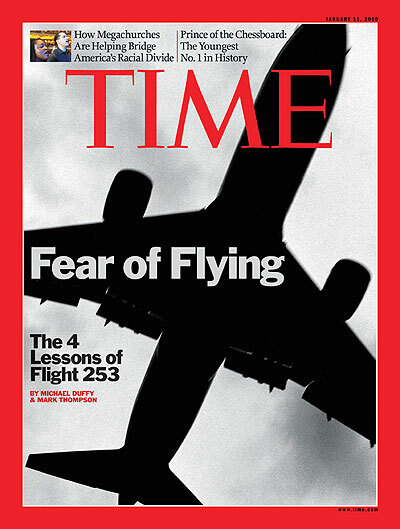 Almost a decade ago (yikes! 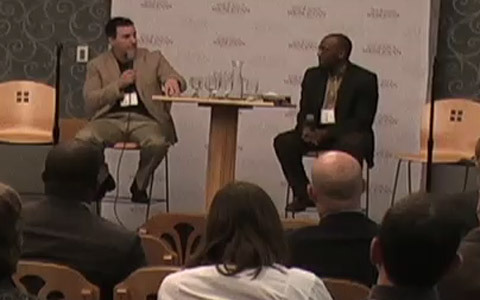 ), when I worked at Christianity Today, we convened a forum of Christian leaders to discuss the then-controversial findings of the just-released book Divided by Faith: Evangelical Religion and the Problem of Race in America by sociologists Michael Emerson and Christian Smith. The book’s thesis, as we summarized it then: Most white evangelicals deny the existence of any ongoing racial problem in the U.S., and many blame the media and African Americans who refuse to forget the past for any lingering racial conflict. And then the whopper: Evangelical theology, with its individualized worldview, actually hinders our progress toward racial reconciliation and social justice in America. Emerson and Smith’s work arguably did more to elevate the conversation about race among white evangelicals than any other book over the last 40 years. 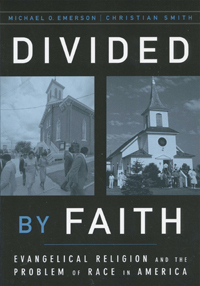 In my own book on Christians and race, I wrote about the significance of Divided by Faith and how it challenged and inspired countless Christian leaders, including, most famously, Willow Creek Community Church’s founding pastor Bill Hybels. That a book on race could actually transform the thinking of one of the nation’s most influential evangelical pastors says a lot, so it wasn’t surprising to see Time magazine pick up on the story too. I was a bit taken aback when Time‘s religion writer David Van Biema called me out of the blue last year to pick my brain on the “desegregation of evangelical megachurch” theme around which his article was taking shape. I initially pushed him to consider the many smaller churches and ministries that had been intentionally pursuing racial reconciliation and diversity long before the ideas showed up on Willow Creek’s radar screen. I suggested that any increase in racial diversity at megachurches like Willow is probably due more to the changing demographics of the suburbs, with their growing numbers of middle-class African Americans, Latinos, and Asian Americans. My theory was that it’s not so much that the megachurches are becoming more intentional about race but that they just naturally offer large, neutral settings for middle-class minorities who don’t feel entirely comfortable in ethnic-specific churches, but who would feel out of place in smaller, all-white congregations as well. The size and seeker-friendly nature of megachurches make them ideal places for minority Christians to just become a part of the scenery (i.e. community) without any pressure to be that church’s representative “black family” or “Latino family.” While I think this is still a large part of what’s happening with the increasing racial diversity in big evangelical churches, I realize that there are many other factors at play as well. And I applaud David for taking on the huge task of exploring this phenomenon. With the Time article reviving the race conversation among evangelicals (at least for another week or so), I thought it would be interesting to chat with David about his article and what he learned, as an impartial observer, about the evangelical community and race. Check out my interview with him at UrbanFaith.com, then come on back and let me know what you think about some of the issues David’s article raises. The Desegregation of the American Megachurch? Since Reconstruction, when African Americans fled or were ejected from white churches, black and white Christianity have developed striking differences of style and substance. The argument can be made that people attend the church they are used to; many minorities have scant desire to attend a white church, seeing their faith as an important vessel of cultural identity. But those many who desire a transracial faith life have found themselves discouraged — subtly, often unintentionally, but remarkably consistently. In an age of mixed-race malls, mixed-race pop-music charts and, yes, a mixed-race President, the church divide seems increasingly peculiar. It is troubling, even scandalous, that our most intimate public gatherings — and those most safely beyond the law’s reach — remain color-coded. Willow’s predicament is hardly surprising. To some white congregants, naming a person of another color to tell you what Scripture means, week in and week out, crosses an internal boundary between “diversity” (positive) and “affirmative action” (potentially unnerving). This sobering observation serves to remind readers that the journey toward true diversity and racial reconciliation in the church is not an easy road. Megachurches like Willow are often looked to for their dynamic ministry models of “how to do it right.” But addressing racial and cultural issues in the local church context does not lend itself to simplistic formulas or 40-day adventures. Overall, though, it’s interesting to see the mainstream press paying so much attention to racial reconciliation issues in the evangelical church. It’s a good reminder that what we do both individually and corporately as Christians is being watched and surveyed by many in the wider culture. Read the entire article here, and stay tuned to UrbanFaith.com for an interview with Time‘s David Van Biema on what he discovered during the process of putting the article together. I’ll let you know when it goes up.